Most of the shutters and doors we make here at Kestrel, both interior and exterior, are built out of solid, kiln dried wood without the use of any laminates. We can do this as the wood species that we use, American Basswood and Sapele Mahogany, are dimensionally stable and react minimally to changes in humidity. 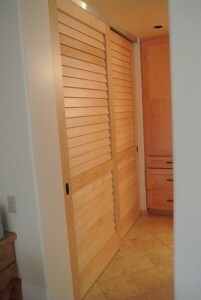 So what happens when you want doors or shutters made from a different species of wood that is not as stable? If we were to make our doors and shutters out of solid woods like Hard Maple, Birch, White Oak and Red Oak, while they would be beautiful they would also be likely to warp. 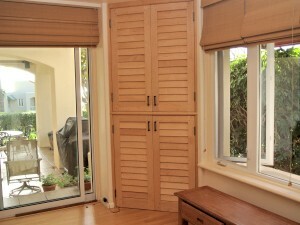 Especially when made to the sizes of doors or larger windows. This is where Stave Core enters the picture. When 2 or more pieces of wood are glued together the chance of warping drops dramatically. This is because if any of the boards try to warp they end up “fighting” against the other boards and are held straight. The only problem is that the glued up boards don’t look as nice as a single piece of wood. So, you take those glued up pieces of wood ( that are now very, very stable ) and glue a solid, but thinner, piece of wood to each face and to edges as well. This is what stave core is: Thin strips of wood, laminated together to make them extremely stable, then covered in pretty much any wood that you want. 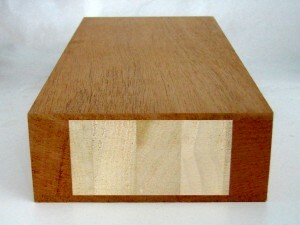 This photo shows a cross section of a Mahogany Stave Core door stile. The front and back faces of the door stile are 1/8″ thick Mahogany and the edges are 3/4″ thick Mahogany. These are wrapped around several smaller pieces of poplar. All of these are laminated together to make a super stable stile which ensures that the interior door made from these will remain straight. Stability. Using stave core for the stiles ( the vertical frame pieces of the doors ) will make sure that your doors will not move over time from changes in humidity. Over-sized doors are not a problem. This ties in with stability but the idea is that by using stave core for the stiles, and even the rails, you can have doors that are much larger than normal. Eco-friendly. Stave core is made up of smaller strips of wood that would otherwise have been discarded. Lighter weight. The cores of our stave cores are made from Poplar or Pine which are both lighter in weight than the hardwoods used on the outside of the stave cores. This helps to keep the overall weight down. 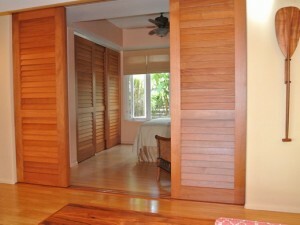 Maple doors, built with stave core, cover a corner media center in this Hawaiian home. If you would like an option for stave core doors just make a note of that in the comment section of our quote request form.